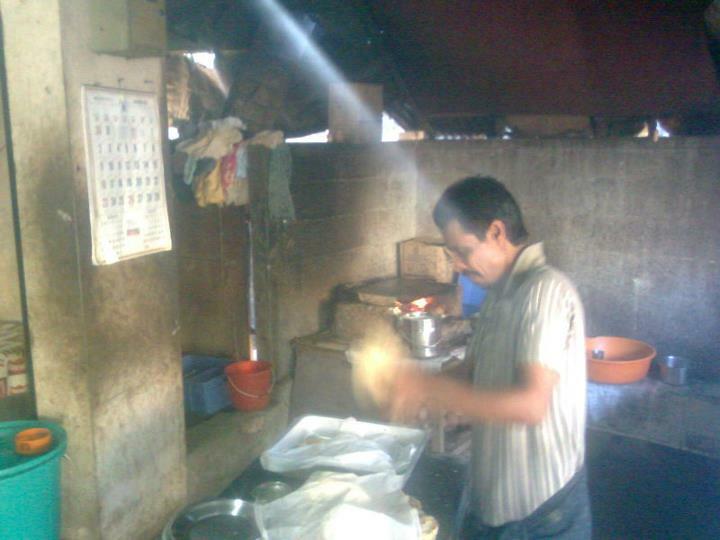 Nizar, the owner/chef at Amantha Restaurant, whose grinning, elongated face is the kind you never forget, had a habit of inhaling on cigarettes as he smoothed out paratha dough on the hot plate. On fine mornings, the smoke swirled elegantly in a beam of sunlight that streamed in through a hole in the corrugated iron shroud. It partially overpowered the sweet and spicy smell of masala but was no worse than the exhaust fumes emitted by passing rickshaws, so if you had objections initially, they quickly melted away (especially if you were also a smoker, as I was at the time). In any case, the taxis roaring by at 80km/h on the newly paved Edava-Papanasam road were a far greater health hazard than any air pollution. More pertinently, the food at Amantha was cheap, tasty, and delivered with a smile. As it was situated at a busy junction, where three thoroughfares meet, the tables were often full. One morning, I was walking over for a breakfast of appam, egg curry, and chai when I spotted Tenzin sitting at one of the front tables, barely a metre or two from the asphalt surface of the road. A large hammer was resting on the table in front of him and he held a glass of chai still in his hand. His eyes bore a hole in the street in front of him, his mind seemingly elsewhere. I imagined him finishing his chai in a single gulp, slamming down his glass, picking up the hammer and striding off to mete out bloody, mafia-style justice to some foolish transgressor. I deliberately walked into his eyeline so that he would notice me, and as soon as he did, the blank expression vanished and his face lit up. Tenzin would smile with his whole face. Everything lifted, from the corners of his mouth to the highest wrinkles on his forty? fifty? year-old forehead, and he looked directly at you with wide and unassuming eyes. Even his voice lilted pleasantly as he greeted you. His intensity from a few moments ago stood at stark odds with his usual serene demeanour, and was quickly forgotten as I reflected his smile. Tenzin had been running his Tibetan shop Wind Horse on the top of the Varkala cliffs for over about a decade at this point, which made him one of the longest serving shopowners in Varkala’s tourist area. Like many other Himalayan natives –- Kashmiris, Tibetans, Nepalis -– he would be in Varkala from mid-August to mid-May every year, and during the May to August monsoon he would return with his wife to Tibet to spend time with family and buy stock for the next season. Together, they would use their customary courtesy and a quiet, unshakeable self-belief to convince tourists they needed beaded necklaces and notebooks made from recycled paper, among thousands of other items in their cliff shack. “What’s the hammer for?” I asked as I sat opposite him, my back to the street. “Pardon?” he replied. Obviously the hammer wasn’t as prominent in his thoughts as it was in mine. “The hammer! It looks like you’re… ready to use it,” I said, hoping he’d understand my implication. These two weeks of construction in mid-July were the exception to Tenzin’s off-season routine. 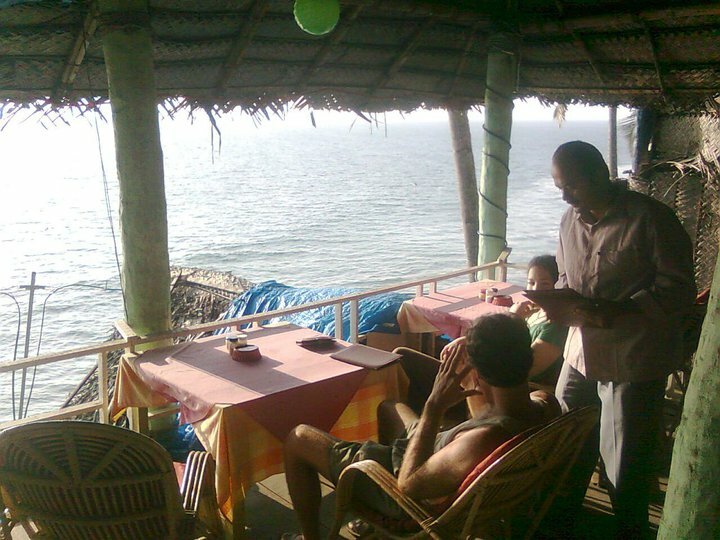 Like many other shopowners on the cliff, he had returned to Varkala early to rebuild his shack, which had deteriorated after a summer’s worth of wind and spray from the Arabian Sea below. This tearing down and rebuilding was Varkala cliff’s yearly regeneration ritual. Most workers who come from elsewhere only make it through one or two of these regenerations before cutting their losses and trying their luck in another tourist paradise. Either they weren’t making money or, worse, they made too much money and got forced out by a local population swift to act against any successful rival to their operations. The end result is that each season a few old shops would disappear and be replaced by new ones. This particular aspect of the regeneration cycle was sometimes made unconsciously explicit in the naming of new establishments. One year, Sun Rise Restaurant was torn down by its departing proprietor and replaced by a row of fabric shops. A little further along the cliff, a new eatery was being erected with an almost identical menu, despite no connection to the previous management. It was called Sun Set Restaurant. Tenzin’s longevity in Varkala was therefore something of a miracle — but it didn’t mean he was exempt from the regeneration, or the quality of local labour. “How’s the work going?” I asked. “Oh, Barnaby, it’s not going very well. These men, if I don’t watch everything they do, they do very bad work. I have to tell them all the time what to do!” He raised his voice above the din of a passing Ambassador taxi racing along the tar seal with its horn blaring. “Even though they are builders and I am not a builder!” He was still smiling, almost laughing at this point, as though this crucial stage of the process -– which sets the foundation for his and his wife’s livelihood until next May -– was just another trifle to be dealt with. Nothing to get too upset about. It was a hard enough fight just to remain solvent for a businessman in Varkala, let alone to remain as calm and collected as Tenzin always seemed to be. The challenges were frequent and ranged from the petty to the physically dangerous. One nightclub-style establishment once had its electricity wires cut by a neighbour envious of its success, while the manager of a textile shack (which also served as his accommdation) awoke one morning to hear a rival placing a venomous snake at the entrance to his shop. One of Tenzin’s biggest problems came when the cocky young Nepalese manager of a new restaurant took a shine to Tenzin’s wife and started openly flirting with her. Within a couple of days, Tenzin called a meeting with him and halted the issue before it exploded, as such matters so often do in Varkala. Despite the affront, he made sure to maintain a positive professional relationship with the guy, and in his shop, with the customers, his smiling demeanour wasn’t compromised. According to a few rare confessions, during which his voice would drop and his gaze would fall from my face to the ground, Tenzin wasn’t always like this. He used to drink and smoke and ride a motorcycle at high speed, late at night, on winding roads carved high into the mountains of Tibet. He used to have extraordinary violence in him that could rise to the surface at the slightest provocation. Something happened to change all that, something he never told me about in detail. All he ever said of it was, “I thought I died. I should have died.” After that catastrophic event, he latched onto a selection of Buddhist and Hindu beliefs that made sense to him, found a guru, and was effectively born again. The idea of an angry Tenzin, which I had never known, seemed impossible to reconcile with the peaceful man I knew. He defeated all comers — not with blunt instruments but with a warm heart and unwavering conviction. I wondered, though, if that look on his face as I walked up had offered a glimpse into his past. Perhaps that violence was still in him, somewhere. Maybe just the memory of it returned to him sometimes, an unwanted but necessary reminder of what he had been, before he files it away again and moved on with his life. He picked up the hammer by its head and allowed it to hang freely from his fingers, like a set of house keys dangling innocently from a forefinger. And off he went down the road armed only with his inner strength, the hammer’s potential menace neutralised. This is a re-edited version of a piece previously published on The NRI, an online magazine bringing together Indians, NRIs and anyone with an affinity to India.